Instructor User Guide ForumsHow do I modify forum template settings? Template Settings control the default settings of each created forum. These settings can be overridden for a specific forum or topic, but must be manually changed after the default settings template is created. 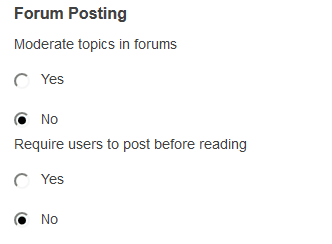 The default settings template allows you configure the default settings for all new Forums and Topics in this site. Template settings allows the option for all topics in forums to be moderated. There is also an option that requires users to post before reading. Template Settings allows the option for all Forums to be shown immediately after they are created or based on specified open (show) and close (hide) dates. Choose if messages are marked "read". Template settings allows the option for conversations to be marked read automatically. Template Settings allows the option to select permission levels within Forums based on user roles or groups within the site. User roles can be given the title of Author, Contributor, None, Nonediting Author, Owner, Reviewer, and Custom. In the Customize drop-down menu, the check boxes are automatically selected based on the permission level selected. If the check boxes are manually chosen, this fulfills the Custom Permission Level. Note: You may see different roles depending on whether your site is a course or a project, and whether or not there are any groups or custom roles in your site. Click Save to save your settings (or Cancel to continue without saving). Prev: How do I delete a forum? Next: How do I watch or subscribe to forums?